Kindly advise, you must LOGIN to the website as a member in order to confirm member pricing for events. For step-by-step directions on how to login, click here. Daniela Rocco Minerbi pursued classic studies at the Liceo Classico Berchet, earned a Fifth Year Piano Diploma at the Conservatorio Giuseppe Verdi, and obtained her Doctoral Degree in Architecture at the Polytechnical University in Milano. She taught Italian language and culture at the University of Hawai’i at Manoa (UHM) and Kapiolani Community College outreach programs. At UHM, she also taught Painting in Italian and co-taught in Psychology, Architecture, and Peace studies. Daniela has organized peace seminars and is the co-author of the book “Macrohistory and Macrohistorians: Perspectives on Individual, Social, and Civilizational Change” (Galtung et al., 1997). As an artist, she has won prizes and awards, has had art exhibitions, and has been curator of several art shows in both Italy and Hawaii. She loves to perform piano four hands and two pianos. Daniela provides consulting services in Architectural Design. For students who have no or minimal grasp of the Italian language—we’ll cover up to chapter 3 of the book Prego (half a chapter per week). Intermediate Level 2: 6:00-7:30pmFor students who have mastered all grammar and vocabulary of Level 1—we’ll cover chapters 4-9 of the book Prego (a chapter per week). By March 31, 2019 register online. 15 students maximum per class. No refunds, except if FOISOH cannot deliver this class, for instance in the case of insufficient enrollment. "Prego!" 6th Edition, available online for $5 and up (used). Other editions are fine to use as well, but you may have a hard time finding correspondent pages. Students review assigned grammar and exercises at home ahead of time, so class time is used to clarify questions, do a couple of exercises, and especially read and speak together. 465 Coral Street, Honolulu. Attention: Ewa side of Coral street, entrance is through double glass doors, up the stairs to your left. Some free perpendicular parking spots by entrance, meter street parking, or Salt Parking Garage. Originally from Napoli (Italy), Iole Marinelli is a Substitute Teacher in K-12 grades with the Hawaii Department of Education (Windward District). She teaches Italian language at Waimanalo Elementary and Intermediate School. She also taught Italian at Saint Anthony School of Kailua. She holds a MA in Foreign Languages and Literatures and a Teaching Certification in English for secondary education from Italy. 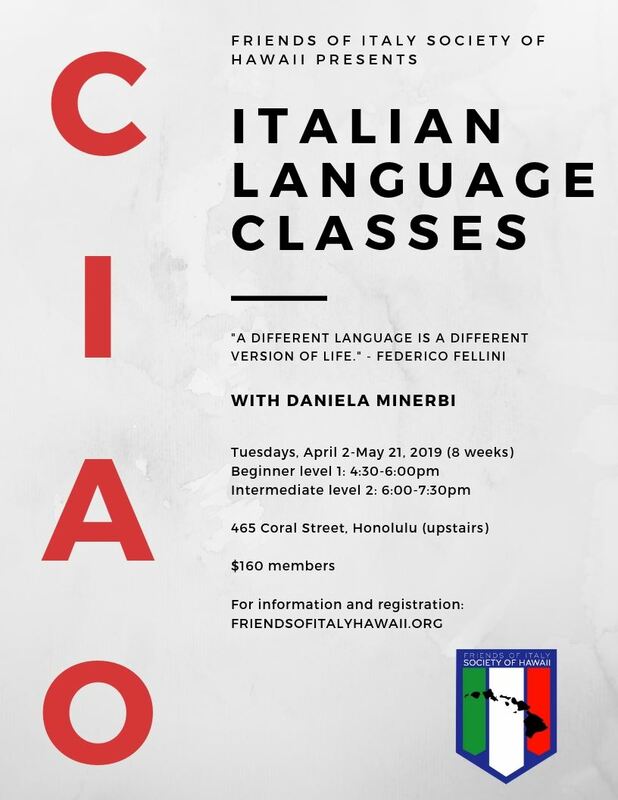 She speaks five languages and is the Italian Representative on the Executive Board of the Hawaii Association of Language Teachers. In a former career, Iole was a Contract Specialist with the US Naval Base Headquarter in Napoli for 14 years, where she was responsible for the contract negotiations in Europe and South West Asia. She likes to cook, to travel, and to watch movies with her son Gabriele and husband Erik. Singing songs, playing, and creating projects will make learning Italian fun! Interactive activities and games will provide students with the basics to communicate in Italian. 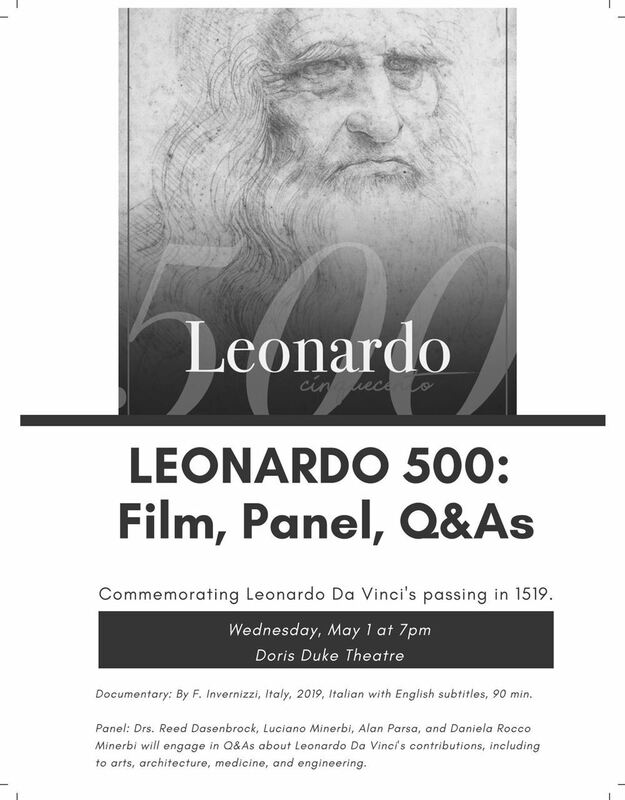 Tickets at https://honolulumuseum.org/events/films/17723-leonardo_cinquecento . Discounted rate of $10 to Friends of Italy members to purchase tickets over the phone or in person at the box office (you just need to mention that you are member of the Friends of Italy Society of Hawaii). In celebration of the 500th Anniversary of Leonardo Da Vinci’s passing, please join us for Leonardo Cinquecento--a DOCUMENTARY on Leonardo’s genius and implications of the famous Da Vinci codes on today’s scientific research. Directed by Francesco Invernizze, Italy, 2019, Italian with English subtitles. Please stay after the film for a PANEL CONVERSATION with Drs. Reed Dasenbrock, Luciano Minerbi, Alan Parsa, MD, Daniela Rocco Minerbi, who will engage in Q&As about Leonardo's contributions to arts, architecture, medicine, and engineering. After serving as Vice Chancellor for Academic Affairs at UH Manoa from 2009 to 2016, Dr. Dasenbrock returned to the faculty where he teaches courses in Italian literature in translation as well as English, Philosophy, Honors and Higher Education Administration. This semester, his course on Italian lyric poetry included work by Michelangelo and Bronzino as well as Petrarch and a number of women poets. Next spring, he will again teach a course on Dante. A life long Italophile and frequent visitor to Italy, he is the author of Imitating the Italians (Johns Hopkins University Press), a book on the influence of a broad range of Italian writers on English literature from 1500 to the present. Dr. Minerbi, professor of urban and regional planning at the University of Hawaii since 1969 specializes in land use, environment, cultural assessment, and sustainability, in Hawaii and the Asia Pacific Region. He consults for international, national, and local groups and organizations. He served on federal, state, and county boards and commissions in Hawaii. Dr. Parsa is double board certified in Internal Medicine as well as Endocrinology, Diabetes and Metabolism. He serves as Medical Director of Pacific Diabetes and Endocrine Center and Queen’s Medical Center West Oahu Diabetes Program. He is an Assistant Professor at the University of Hawaii John A. Burns School of Medicine. Dr. Parsa studied Marine Physics at University of San Diego and Medicine at St. Georges School of Medicine. He completed his residency at Seton Hall University (New Jersey), and fellowships at Mount Sinai School of Medicine (Manhattan) and Cedars Sinai Medical Center (Los Angeles). Dr. Parsa grew up on Oahu, lived in Italy, and speaks Italian fluently. Dr. Rocco Minerbi pursued classic studies (Liceo Classico Berchet), earned a Fifth Year Piano Diploma (Conservatorio Giuseppe Verdi), and obtained a Doctoral Degree in Architecture (Polytechnical University) in Milano, Italy. She taught Italian language and culture, painting in Italian, psychology, architecture, and peace studies at the University of Hawai’i at Manoa and Kapiolani Community College. Dr. Minerbi is the co-author of the book “Macrohistory and Macrohistorians: Perspectives on Individual, Social, and Civilizational Change” (Galtung et al., 1997). As an artist, she has won prizes and awards, and had art exhibitions in both Italy and Hawaii. Italian Village at Hoa ʻĀina O Mākaha: 40 years! Gigi Cocquio's Hoa ʻĀina O Mākaha is celebrating 40 years! 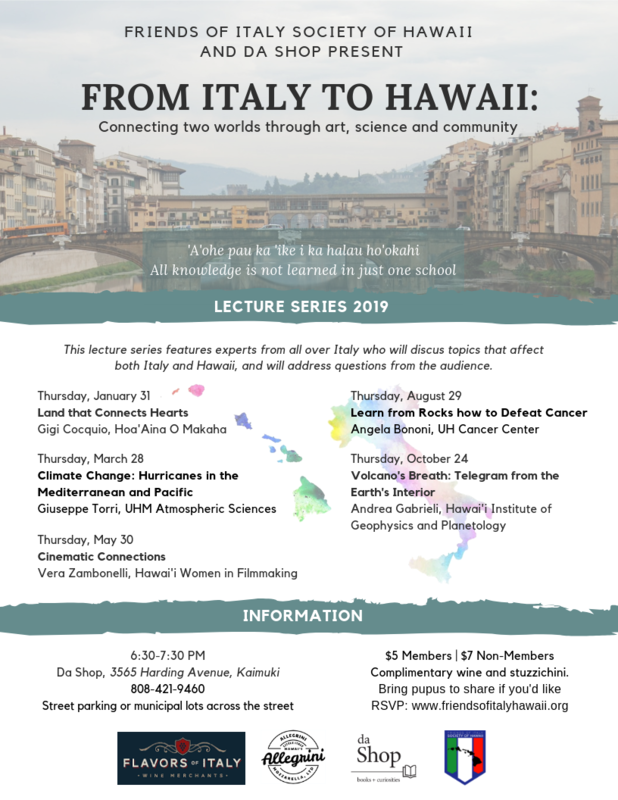 Join the Friends of Italy Society of Hawaii to commemorate this milestone! On May 4th at 1-4pm, the farm will have is annual Open House and we'll offer an Italian Village with biscotti making, pizza, gelato, live Italian music, and anything you feel like sharing. Please email Chiara at chiaralogli@hotmail.com if you'd like to participate. Or, just come and celebrate with us our beloved Gigi and his seeds of peace in the world. Everyone is welcome, free for all. Complimentary Italian wine by Flavors of Italy and Italian delicacies by Little Italy Hawaii for your "aperitivo." Bring pupus to share if you'd like. 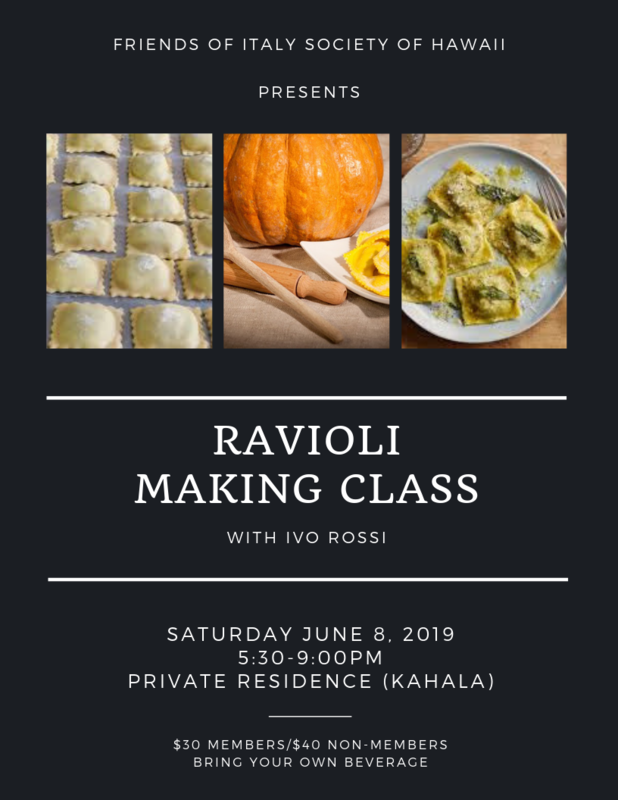 Join Chef Ivo Rossi for a making- (and eating-) ravioli class, featuring ricotta cheese, butternut squash, butter, and sage (ravioli di zucca al burro e salvia). The class will end around 7:30pm and will be followed by a dinner together. Please bring wine or pupus to share. Registered attendees will receive an email with the address. 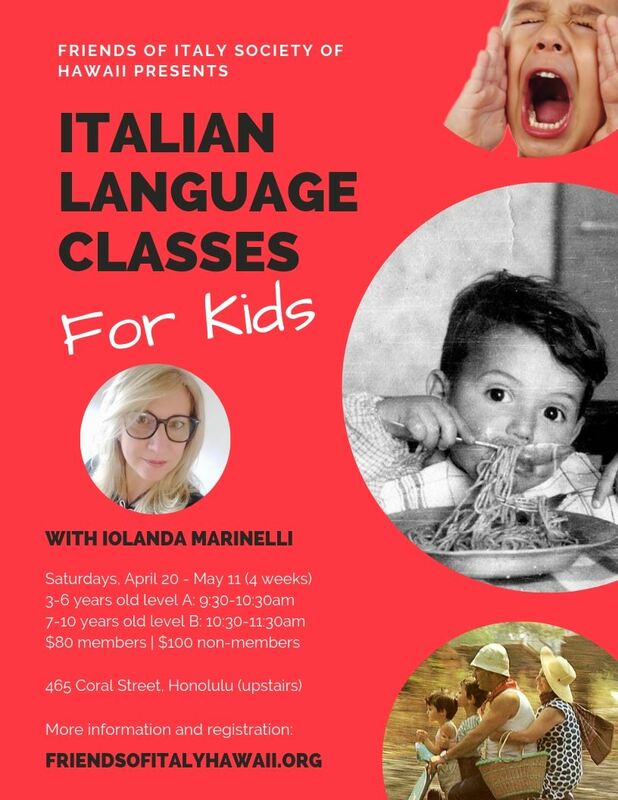 For questions, please email info@friendsofitalyhawaii.org. 14 Apr 2017 Honolulu Museum of Art Presents "Maurizio Cattelan: Be Right Back"